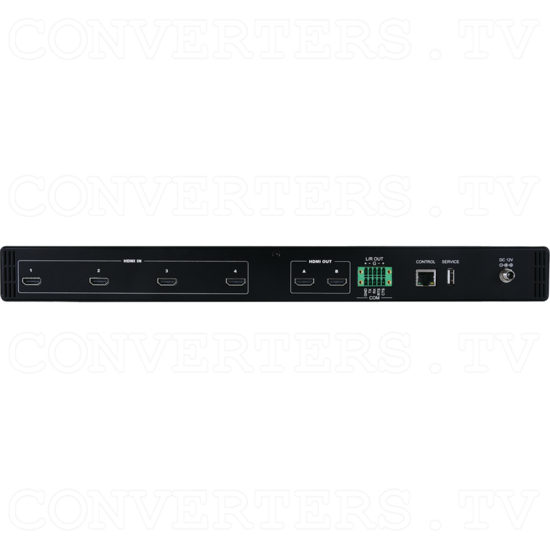 The 4 x 2 HDMI 4K UHD Seamless Matrix with PIP and Scaling allows any one of four HDMI sources to be displayed either individually to 2 full-screens, or displayed in a combination of multi-window modes, including quad-window" and "Picture In Picture" (PiP), over the two screens. Latest technology UHD 4K@30Hz video and up to 7.1CH audio is supported by the 4 x 2 HDMI 4K UHD Seamless Matrix with PIP and Scaling and is compatible with HDCP 1.x and 2.2 standards. DVI video may also be processed by using a DVI to HDMI adaptor. 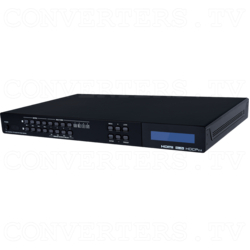 System management and integration of the 4 x 2 HDMI 4K UHD Seamless Matrix with PIP and Scaling is controlled a number of ways, including front panel soft-touch buttons and IR remote, plus PC based programs using protocols like RS-232, TelNet and WebGUI. An ideal tool for use when requiring multiple displays for monitoring in Control room and Offices, workshops or classrooms. 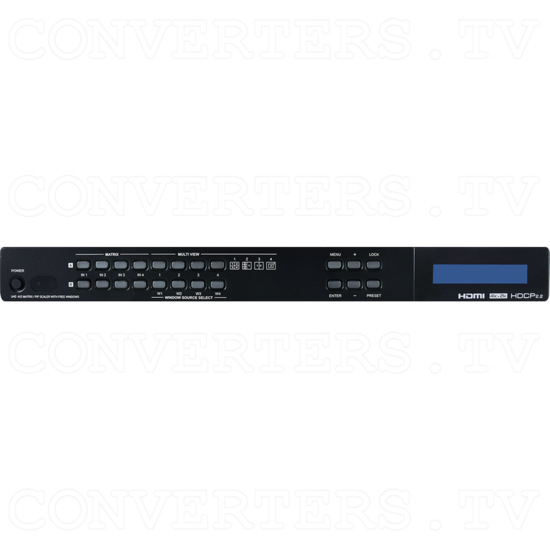 The 4 x 2 HDMI 4K UHD Seamless Matrix with PIP and Scaling allows any one of four HDMI sources to be displayed either individually to 2 full-screens, or displayed in a combination of multi-window modes, including quad-window" and "Picture In Picture" (PiP), over the two screens. Latest technology UHD 4K@30Hz video and up to 7.1CH audio is supported by the 4 x 2 HDMI 4K UHD Seamless Matrix with PIP and Scaling and is compatible with HDCP 1.x and 2.2 standards. DVI video may also be processed by using a DVI to HDMI adaptor. System management and integration of the 4 x 2 HDMI 4K UHD Seamless Matrix with PIP and Scaling is controlled a number of ways, including front panel soft-touch buttons and IR remote, plus PC based programs using protocols like RS-232, TelNet and WebGUI. An ideal tool for use when requiring multiple displays for monitoring in Control room and Offices, workshops or classrooms.